I think you are speaking of Lara Rivera ... the owner of Black Cat Rootshack. I was wondering the same thing actually. Lara Rivera is no longer a member of AIRR. She has other things in her life that require her attention and we wish her well. I cannot speak for her, but last I heard she is not actively taking on rootwork or reading clients. Thanks for answering and best wishes to her!!! I just wanted to say that I popped in my local metaphysical store yesterday (The Owl's Nest in Frederick, MD) for some quick items, and imagine my delight when I found a whole new section devoted to LM products! So many oils, and curios, and salts/sachets/incense packets! It was so nice to be able to browse the products in person, and only a few miles from home. Took some real willpower not to buy one of everything! I enthused to the owner about LM, and how glad I was to see the line there, and she said that several of the staff at the store would be taking Miss Cat's course so they would be able to help customers with the products if they had questions. So I hope that means they intend to carry them for a good long time! The oils looked like they'd been selling well, for sure. Hopefully they'll expand what they carry even further, to include more of the candles. The mark up on oils was perfectly reasonable, especially since I could sniff them all out and no shipping charge! I picked up a bottle of protection oil (my partner needs a little extra oomph for her workplace lately) and oh golly, it smells fantastic. Minty and wonderful, and just what I'd come looking for. I felt better just waving it under my nose, and it wasn't even for me! Later in the month I plan to go back and really stock up on some things. Wonderful source for Lucky Mojo in the DC area! Thanks threedoves, btw, love that avitar. I was checking to make sure that The Curio and Candle Shop out of Nashville Tn., is an authorized seller. I came across her shop on ebay, and I am within an hours drive to her shop in Nashville. I would like to order her supplies if she's an authorized reseller. Yes! 13 Moons, under the proprietorship of Jeff Brown, is a great retailer and carries genuine Lucky Mojo products! Yes, Melanie M. Huffine is a graduate of the HRCC and her Nashville Curio and Candle Shop is a fine wholesale customer of ours. And, yes, The Owl's Nest is now carrying our line of oils, etc. for all the folks in the DC Area. I am an authorized reseller and have Lucky Mojo products for sale. I will be ordering more soon. PM me, especially if you are in the Seattle area. I am an authorized reseller on EBAY. But Like Miss Bri said, You have to be a shop to be listed. I am home based, where clients do come to my home to purchase items. The Blackcat Root shack is no longer a shop on Ebay but I am active. I am an authorized seller of LMC products on Ebay. Miss Bri was correct that in order to be listed, you need to have a physical store. I am home based and my clients come to my home to purchase LMC items. I am also selling on Ebay. I am an authorized seller and I have a store in Santa Monica, CA. I don't know if this question is appropriate as it is for LM products but not from the actual LM store. I have placed 3 orders (for oils, incense powder, sachet powder, honey jar spell kit and Rose buds) with Pagan Magic since the 5 October and haven't received any of them as they say that they are awaiting delivery of supplies from LM - has anyone ordered stuff from them before and had such a long delay in receiving their products? I just wanted to mention that I have bought from Both Mama Micki & Ms. Melanie on Ebay. I received great treatment, excellent service and fast shipping from both. So, if you have any concerns, I would put that out of your mind. Everything I have ordered and received is "real" Lucky Mojo product. Nice to be able to work with other grads, and students this way as well. Thank you for your kind words. I have just opened an Ebay store, and hope to have more items soon. Hi. I just found a store on ebay UK selling LM stuff can anyone tell me if it is and official reseller - the store is called 'thewitchshop' and the owner is deliriumtremensjunkie. http://stores.ebay.co.uk/thewitchshop?_rdc=1 (the Witch Shop) is a legitimate wholesale client of Lucky Mojo and an authorized reseller. Be aware, however, that this shop also sells goods made by other manufacturers (some of them very cheaply made and containing no traditional ingredients, and, no, i will not name names). What this means to you as a buyer us that not all of the oils, powders, incense, or bath crystals this shop offers on ebay will be Lucky Mojo products -- but if you can see by the ebay image of our distinctive labels that what you are bidding on or buying is a Lucky Mojo packet or oil bottle, you can be sure that this is what you will get. Thank you Cat for your reply. I always check, as carefully as I can considering that I can't actually handle the product, that it is a Lucky Mojo product as I wouldn't buy any other brand. Cat. Can you tell me if Pagan Magic are still clients of yours? I ordered some LM stuff from then in mid October and they keep telling me that they're having problems with thier orders and can't find out whats happening when they contact you. I am a customer of Melanie's on eBay, she is wonderful to work with! I purchase from her in between my large orders placed with Lucky Mojo. Mama Micki I am going to have to find and check out your eBay shop!! Anna -- Pagan Magic UK placed an order with us on 12/10/11 and it is fine and they just placed another, larger, order today 1/3/12 and it is in process now. They order about twice a month. We have had problems with their credit card, due to our merchant system not accepting their credit cards which are "foreign" to us (this happens with other large overseas orders as well) -- but we tend to be able to contact those problems rapidly. Thank you Cat - I'll email them and see if they have my stuff. Cat. I apologise for bothering you again. I have contacted Pagan Magic and they say that they haven't received the items I ordered in October: Reconciliation Honey Jar kit, Love Me oil and Return To Me oil. I am beginning to wonder if they are reliable - can you tell me if there would be a reason why they haven't received these items. Are there any eBay stores that ship to Canada? Cheshanna: Pagan Magic's October order contained a Reconciliation Honey Jar kit and Return to Me Oil, but no Love Me Oil. This order was shipped to them a while back. In December they ordered another Reconciliation Honey Jar kit and Love Me Incense Powder, but no Love Me Oil. Mistyblu, you will have to work that out with the various ebay retailers who carry Lucky Mojo proucts-- they should list their terms of shipping clearly on their items for sale. Maybe one or more of them will also post here and let us know. Thank you for your reply miss cat. I finally got my order on 14th January - I can't wait to start my honey jar. I just love all the LM products I have received so far and plan to order many, many more. Cheshanna -- i am glad that worked out! I was getting a little worried there myself -- but as i have said before, Pagan Magic UK is a good shop and a good UK retailer of Lucky Mojo products. I'm glad you like our spiritual supplies and i hope that they bring you much success. Is the "traffic tracking" level of on-line affiliate still available? On the page explaining the program, there is a link to the Black Cat Root Shack, but clicking on what looks like the affiliate link there does not take you to Lucky Mojo. Is lara still the one to email for a link? To the best of my knowledge, Lara is no longer affilated with Lucky Mojo or AIRR and has closed the Black Cat Root Shack, at least on Ebay. Thanks, but I'd already figured that out from some other posts. My real question is, is the on-line affiliate program, specifically the traffic tracking level, still active, and who do I contact to set it up? The webpage about it is dated 2009, and, as you have noted, has some obsolete information. I suggest you call or email the shop to find out if the on-line affliliate program is still available. I have ordered from them and waited three odd months, to the point where I canceled the order & asked for a re-fund. I am aware that LM make their supplies fresh, but I doubt that it would take that long. Even if you order normal products from them (some incense for example - non-LM) I waited about 6-7 weeks for the delivery... This was standard incense. I don't think they stock products, I think they order when the need arises, their probably slow to order on their end causing such delays. I'm not sure what to make of pagan-magic, many reviewers have had the same problem. I know you made your post some time ago, but for the benefit of others I thought I'd throw in my experience dealing with them. Please let me know the shipping fees...I don't want to buy anything from ...(you know) anymore, it's like I need to wait forever...I will order stuff from Lucky mojo online shop directly in future. Haha, when I e-mail them (you know who as you put it lol) they seem like nice, helpful people - but there is only so much patience one can have & niceties can only take you so far in customer service unfortunately. I'll let you know the cost and give you a list of items (without product details, just the number of oils, incense etc) as soon as they are sent. Does anyone know if The Curio and Candle Shop in Nashville, TN are reliable e-bay resellers? It says that they are and that the lady who owns it is a graduate of Cat's class. Sol wrote: Haha, when I e-mail them (you know who as you put it lol) they seem like nice, helpful people - but there is only so much patience one can have & niceties can only take you so far in customer service unfortunately. I found a post wrote by sugarbaby said ups flat rate box is the best option, she bought about 9kg items, only cost her around 20 pounds for shipping...consider ...(you know) selling stuff so expensive...especially, vigil candle... I think the shipping fees is reasonable. Sol wrote: Does anyone know if the curio and candle shop are reliable e-bay resellers? It says that they are and that the lady who owns it is a graduate of Cats class. Pagan magic give me the same issue, why are they selling products they don't have? yet refuse to list them as out of stock. It's actually quicker and cheaper to buy from LM direct, I find Pagan magic very misleading. I just wanted to let everyone know that a dear friend of mine and also forum member Madame Pamita will be having a store opening May 2nd! She is a Lucky Mojo Hoodoo Correspondence course graduate as well. She will be selling lucky mojo products! So if you are in the Los Angeles Area, or willing to travel to her wonderful shop stop by! Her shop hours are from 11am to 8pm...Wed through Sunday! So again come and get your lucky mojo products! I will also be there tomorrow for the grand opening, and I will be there selected days of the week! YAY! So come and visit us...hope to see you there! Finally a local shop that sells LM products. Awesome! Hope you will come visit nana664! Absolutely! I can't make it to the store opening, but will definitely visit soon. i used the search option and didnt find anything so here it is. ive recently come across this website: it is called black cat hoodoo, located in az, it seems. same as lucky mojo's. and also, the products are very similar to the ones in the lucky mojo shop. mentions their connection to lucky mojo. they dont seem to be in business any longer. does anybody know if there are any copyright issues with this site? 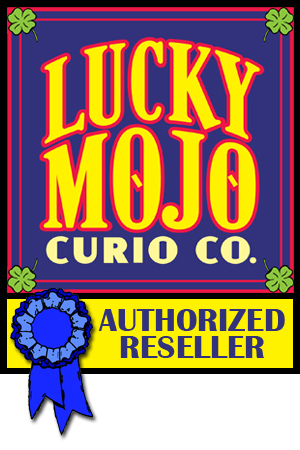 Yes, The Curio and Candle Shop in Nashville, TN is a reputable e-bay reseller of Lucky Mojo spiritual supplies and conjure goods. The proprietress, Melanie Huffine, is a graduate of my Hoodoo Rootwork Correspondence Course and has recently put in an application to AIRR. She has posted in this thread under the name Ms Melanie. Mama Micki, who posted above, is another reliable and reputable Lucky Mojo reseller on ebay. Jazzie, thanks for pointing out the Black Cat Hoodoo shop in Arizona. Most of the online catalogue consists of names almost identical with Lucky Mojo products, complete with SKU numbers almost identical with Lucky Mojo SKU numbers (e.g. OIL-DRS-XXXX where we would have OIL-HOO-XXXX). It looks like it was deliberately intended to create confusion in the mind of the buyer. I thought at first that you were referring to Black Cat Root Shack in Texas, formerly run by my friend Lara Rivera. As one time Lara was not only the web mistress of our Lucky Mojo Catalogue sub-site, but she helped us start up this forum. She was also, at that time, the largest Lucky Mojo (and hoodoo in general) reseller on ebay. Health problems and the need to pay attention to her family caused her to bring her business to a close, but she had her web sites pre-registered for several years, so she has kept them open and there are links on them which she has graciously and kindly pointed back to our home site. She remains a friend, as does her husband Dave, who still does occasional computer programming for us. Prayers out to Lara for good health!...She was definitely awesome with her vast amount of LM products. I have ordered from both Mama Micki and Ms. Melanie. Awesome Ebay sellers. I'm on the east coast and have gotten in orders in record time, 2-3 days. in copyright theft against lucky mojo. and tell me what's the status of my post? maybe, the subject matter is a non-issue, still, i would like to know. know what's going on with this store. this is not black cat root shack, which im familiar with. this store is called black cat hoodoo and it is located in arizona. anywho, if nothing weird is going on, then it is a non-issue then. It looks like it was deliberately intended to create confusion in the mind of the buyer. that is precisely what was bothering me about the site. and everyone knows that lucky mojo products are the best..
it is a very subtle tactic from their part. i'll let my friends now. The only link to the seller is the name "Noirtees" and, when i looked this up in my database, i found that it connects to a former student of mine, Laura A. Hair of Avondale, AZ, a.k.a. Laura Profits, DBA Argenta, DBA Sister Moon Mystical Supplies, DBA 777 Black Cat Hoodoo, DBA Black Cat Curios, DBA Noir Tees. Laura Hair graduated from my course, then on 9/10/07 she came for a free three-week apprenticeship with me, but when she was asked to sign our standard apprenticeship non-disclosure agreement (which has been willingly signed by almost 100 apprentices and employees over the years), she got into her car and blew out of here like a bat out of hell. She is NOT an authorized Lucky Mojo retailer. Neither of the two phone numbers on the site work, but i have an older number for her from our database and i will be talking with her about how she can move away from the appearance of unfair trade practices that arose due to her semi-copies of my site, right down to the SKUs, creating confusion in the mind of the buyer. I'm Gonna Live The Life I Sing About In My Song. It's a powerful message. What it means to me is that if you want to sell spiritual supplies, you need to be a spiritual practitioner, not ashamed of what you do. Spiritual practice is not about making money, it's about being of service to people and of service to Spirit -- and you can't serve either if you are running scared. Her reasons seem kind of bogus because it is unlikely that her employer would even come across her website, and labels and pictures on the products wouldn't necessarily identify her. She should post pictures of her products to make it clear that either she makes them herself or gets them from another source. Many of my customers seem pleasantly surprised that I sell authentic Lucky Mojo products. I guess there is more fraud out there than I realized. Any retailers in the Houston area? We used to sell to a place called The Root Shop in Houston, run by Michelle D. Dawson -- but she has not ordered in the past three years. Sorry, nobody else comes up for Houston. Try the various ebay shops -- they carry an amazing amount of our most popular products, or order direct from us. I ship my orders within one business day, the same day if possible. I'm trying to build up my inventory of Lucky Mojo products, so if there is something that you are interested in, let me know. I'll try to include it in my next order. Thanks Mama Micki. Question: where do I order it from, your store on Ebay? Also, I see you live in San Antonio. Do you have a store there, or just the Ebay store? I live in Marysville, Washington, but it should only take a few days to get items to you. I'll PM you with my eBay store address. On ebay your best bets are Mama Micki (as she posted) and Ms. Melanie (the curio and candleshop on ebay). I've bought from both. Melanie usually has a really good inventory and also gives really good readings (if I'm allowed to say that!) And they both ship pretty quickly. Mama Micki, how do I find you on ebay? I have tried searching for you before with no success. I'm not very tech savvy..